Join us for a fun book discussion at the Heritage of Sherborn. 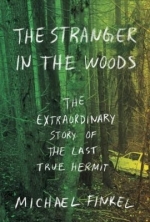 Stop by the Library to pick up a copy of Stranger in the Woods by Michael Finkel, the true story of a man who lived alone in a tent in the Maine woods, never talking to another person and surviving by stealing supplies from nearby cabins for twenty-seven years. Join us for a book discussion over pizza and appetizers. Food is generously provided by the Friends of the Sherborn Library. 21+ only. Capacity: 5 of 20 spaces available.